"The Obama administration... has made a decision to disclose the ET presence." -– Brand new "Zero Limits III – The Final Chapter" DVD's released. -– The next Miracles and Inspiration conference call will be on Tuesday, September 1, 2009. 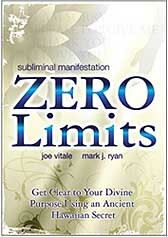 -– Brand new Zero Limits DVD released with Joe Vitale, Mark Ryan and Dr. Ihaleakala Hew Len entitled, "Subliminal Manifestation: Zero Limits"
-– "Fire the Grid," is a global meditation that is to begin on Tuesday, July 28, 2009 at 19:19 Rio di Janeiro time — 15:19 (3:19 PM PST/ 6:19 PM EST). -– The notes and the recording from the most recent Miracles and Inspiration conference call from Tuesday, July 21, 2009 are now available. -– Introducing The Love Intention, our latest addition to our Tools for Transformation section. -– The next Miracles and Inspiration Conference Call will be Tuesday, July 21, 2009. -– The notes from the most recent Miracles and Inspiration conference call from June 16, 2009 are now available. -– New Zero Limits video released, "Zero Limits – Live from Maui" by Joe Vitale and Dr. Ihaleakala Hew Len. -– David Wilcock has posted a very inspiring article well worth investigating entitled, "The Great Awakening: 2012, Ascension and NWO Defeat." Is the Vatican easing humanity toward alien disclosure? You can take it to the bank now. A new world-wide economic system is all but inevitable. Rumors have been swirling for years that a some kind of a new monetary system would be introduced to the United States, and eventually, to the rest of the world. With a global economic crisis raging, economists and the Obama administration have been dropping enough hints that big changes are coming. Rumors have also been very strong that a so-called "banking holiday" will be announced for a period of time, which would find the nation's financial institutions, including Wall Street, shut down for a period of days, or perhaps weeks. But now the Vatican has come along to make it all official. Just hours before the the G-8 Summit was to get underway in L'Aquila, Italy, Pope Benedict XVI made an announcement that is a sure sign that a new banking and/or economic system is in the works and could be revealed soon. 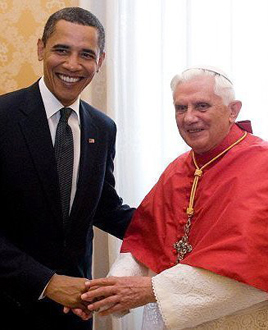 VATICAN CITY — Pope Benedict XVI called for a new world financial order guided by ethics, dignity and the search for the common good in the third encyclical of his pontificate. In "Charity in Truth," Benedict denounced the profit-at-all-cost mentality of the globalized economy and lamented that greed had brought about the worst economic downturn since the Great Depression. VATICAN CITY — Pope Benedict XVI on Tuesday called for a radical rethinking of the global economy, criticizing a growing divide between rich and poor and urging the establishment of a “true world political authority” to oversee the economy and work for the “common good. These statements by Pope Benedict XVI absolutely reek with irony. Here is the leader of the richest, most powerful institution in the world, that has benefited enormously from the current corrupt and unjust economic system, calling for changes. Change to what, pray tell? "True world political authority," "new world economic order," "globalization," "outsourcing"? These choice words sure sound like the long rumored "New World Order" that has purportedly been in the planning stages for decades. However, there are equally numerous indications that a new precious metal backed currency will be introduced by the US Treasury, with other favorable governmental changes to be announced soon after. News reports are already emerging from the just completed G-8 summit with headlines that read: "World has avoided economic disaster, Obama says." Clearly, some major deals have been brokered and now we shall soon see the results. But the question remains, has the Vatican taken steps to be proactive on this news, or is it attempting to get on the bandwagon for positive changes? Regardless of what transpires, all signs and prophecies are pointing towards a major shift of consciousness for humanity, which may begin near the end of 2011, or sometime in 2012. Also noteworthy about the Pope's announcement was the amazing numerology for the date of July 8, 2009, which breaks down to a 7, 8, 9. Further coupled with the prophetic clock times of 12:34:56 AM and PM, formed a perfect sequence of numbers: 1, 2, 3, 4, 5, 6, 7, 8, 9, on this day, which only happens every one hundred years or so. In addition, this latest pronouncement by the Pope was the second mind blowing admission by the Vatican in the last fourteen months that clearly indicate the world is imminently poised to see some major revelations unfold. In May of last year, Vatican chief astronomer Father Jose Gabriel Fune, surprisingly revealed to the world that "just as we consider earthly creatures as 'a brother,' and 'sister,' why should we not talk about an 'extraterrestrial brother'? It would still be part of creation." This shocking confession out of Vatican City seemed to portend the next logical step would be the official acknowledgement of ET's by various world governments. Additionally, strong rumors abound that President Obama may reveal the truth about extra-terrestrial involvement with our government, sometime during the month of September 2009. Recently, organizers of the fifth annual X-Conference 2009 in Washington, DC, laid enormous pressure upon the US government to reveal the truth about ET's or they threatened to do the job for them. In fact, the X-Conference leadership, which included former astronaut, Edgar Mitchell, hinted that another country, possibly France, may have already made plans to reveal the extra-terrestrial presence to their citizens, ahead of the US. Uploaded by ExopoliticsDenmark. - News videos from around the world. "The Obama administration, through the nature of who they have appointed and other information I am receiving, has made a decision to disclose the ET presence," he stated, though he cautioned this was his assessment and not any official word from the White House. "...we are encouraging the administration, which has dedicated itself to openness and transparent government, to commit to the ultimate act of openness and transparency and to do it immediately," he strongly added. "If it does not disclose by the end of May (2009),... PRG has a substantial network and quite a bit of documentary evidence, particularly politically,... and we are going to be extensively putting that out to the media. We are going to make it as difficult on them (the Obama administration) as possible," Mr. Bassett warned. Therefore, in conclusion, with the Vatican weighing in on these major political/economic/scientific issues, and so much speculation of impending economic changes filtering from numerous sources, there can be little doubt that humanity is poised on the brink of some major planetary developments. The most profound and extraordinary transformations in the history of the human race are imminent. The world awaits with baited breath. We captured video from this unique event, including an interview with him (Dr. Pete Peterson) by yours truly — and this footage should be released very shortly. Among many astonishing things he shared with us, thanks to one of his inside contacts, we learned that the Obama administration has an active plan to disclose the reality of the extraterrestrial presence before the end of this year. Television time has already been booked — and we are told that several different ET groups will be revealed, all human in appearance, with the understanding that our government has secretly been in contact with them for over 100 years now. He was concerned that this might not happen, as all the inside power-players he used to work for would like to block it. They are NOT pleased with Obama… AT ALL. Peterson felt Obama was very lucky he had made it this far already, given how much these elements would like to see him ‘removed.’ This, to me, strongly suggests there is spiritual protection in place." UPDATE #2: July 23, 2009 – Exopolitics Europe will be conducting a special conference event, the European Exopolitics Summit 2009, over the weekend of July 24 – 25th. Guest speakers will include Stephen Bassett, Alfred Webre, Dr. Steven Greer, Dr. Brian O'Leary, Nick Pope, Robert Dean, Dr. Michael Salla, and Paola Harris, among others. Press Conference - National Press Club - X-Conference 2009 - Washington DC - Part 1 of 2 (HD) from Exopolitics Denmark on Vimeo. Press Conference - National Press Club - X-Conference 2009 - Washington DC - Part 2 of 2 (HD) from Exopolitics Denmark on Vimeo.